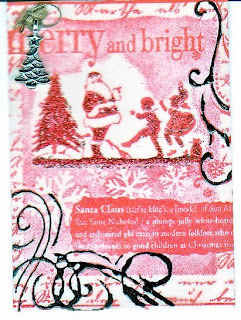 I entered my first ever ATC into the Trimcraft Christmas ATC Challenge, and wasn't expecting to get anywhere with it being my first, but was thrilled and amazed to win it. Expect to see more ATCs from me in the future as I think I'm going to catch the 'bug'. I stamped an image with red stazon, then embossed it. The swirls are done with a black Sakura glaze gelly roll pen. I then added red Stickles to the picture and a metal charm in the corner.